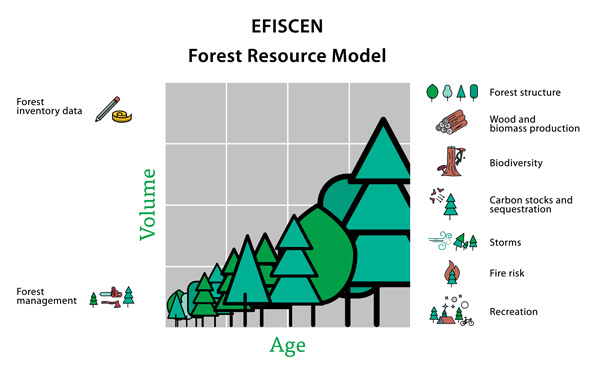 The European Forest Information SCENario Model (EFISCEN) is a large-scale forest model that projects forest resource development on regional to European scale. The model is suitable for the projection of forest resource development for a period of 50 to 60 years. The model uses national forest inventory data as a main source of input to describe the current structure and composition of European forest resources. Based on this information, the model can project the development of forest resources, based on different scenarios. These scenarios are mainly determined by management actions, but the model can also take into account changes in forest area, as well as changes in growth e.g. due to climate change. Through its underlying detailed forest inventory database, the projections provide these insights at varying scales, thus serving forest managers and policy makers at the national and international levels. EFISCEN is jointly developed by Alterra and EFI. The model and its source code are available for anyone interested in using the model. Many people have contributed to the development of EFISCEN, both at EFI and Alterra. The model developers are Jo van Brusselen, Jeannette Eggers, Ville Ikonen, Ville Immonen, Anu Horttanainen, Timo Karjalainen, Inga Kharanen, Janne Kiljunen, Marcus Lindner, Gert-Jan Nabuurs, Risto Päivinen, Ari Pussinen, Mart-Jan Schelhaas, Andreas Schuck, Ola Sallnäs, Matti Suokas, Tommi Suominen, Esther Thürig, Hans Verkerk, Bert van der Werf and Sergey Zudin.